After downloading, you ﬁnd an archive containing the Software (zip ﬁle), if it didn’t expand automatically, you can double-click on it to expand with the Finder. After expansion of the archive, you will have a new folder named Barres V II.5.0 on your Mac. You can launch the software from here, but if you use it regularly, we recommend you to place the folder (or the application alone) in the applications folder. 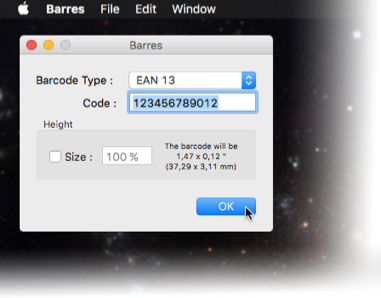 When you launch Barres, a dialog-box appears, requesting for a selection of the barcode type, a text-field for changing eventually the barcode height, and a text-input for the code itself. 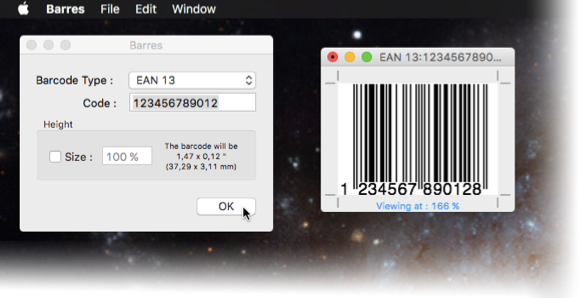 You then choose the type of barcode, according to your needs, choosing UPC, EAN 13, or SCC 14 and you enter the value, either by typing, or by copying from the clipboard. You can enter the full code, including the checksum(s), or just the significative part of the number. In all cases, the software will calculate the checksum, and add it if you didn't give it, or replace it if you entered a wrong one. If you want to change the height of the barcode, click on the height checkbox if it isn't selected. This will unlock the percentage field, and you'll be able to type any value between 10 and 999 % (you must be carefull: it could be difficult to read the code with a barcode scanner, if it is too small). The final size of the barcode graphic, if printed at 100%, is constantly updated in the dialog, in inches and in millimeters. The image of the barcode is then displayed in a window, ready to be used. You can save the graphic for further use in EPSF or PDF format (the choice is made with the "Format" local menu in the save dialog). The file default name is the concatenation of the barcode type's name and the code. The two graphic formats are vector-based formats, they can be resized without losing quality; the bars and the text are black (the color can be changed with any drawing software), and the background is transparent. In the epsf format, in addition, the black color is in overlay mode, usefull if the barcode is printed over a colored background. The epsf format is been optimized for use with Postscript systems used for professional publishing. The ESF generated file is in CMYK mode and the black used for the bars and the digits overlays the background. The font used is a regular Helvetica. The file can be directly imported in an image block in XPress (3.32, 4.1 and 6.1 have been tested) and in InDesign (2 and CS have been tested), but it can also be opened with Illustrator (8 to CS have been tested). This software has been tested in real use with a 2400 dpi imagesetter. You can also rasterize the picture with Photoshop (5, 7 and CS have been tested): you should use a resolution between 600 and 1200 dpi in "Greyscale" mode, then convert in "Bitmap" mode with the option "50% threshold and save in TIFF format. The TIFF file could be colorized withXPress or InDesign if necessary. You should NEVER print the rasterized barcode in "CMYK" or "Greyscale" mode, this two image modes are not suitable for a barcode scanne readable reproduction. And there you go!!! Now you know that there's nothing simplar than barcoding. You see, in the time it has taken to read this explanation you could have generated some barcodes. Thanks to Nicolas Castellan (http://www.nicolascastellan.fr) for his graphical work (the pretty icon). I would like to receive information and special promotions on Antilog products. Please note that your e-mail adress will be kept strictly confidential and will not be shared or be available to other companies, or individuals.